Developmentally appropriate practices must guide decisions about whether and when to integrate technology and interactive media: Making sure we are not swapping out paper for an ipad and giving ‘electronic worksheets’ is the first thing that came to mind when I read this. Professional judgment is required to determine if and when a specific use of technology or media is age appropriate, individually appropriate, and culturally and linguistically appropriate: I think it is a good idea to take other reviewer’s advice when considering sites or apps for your kids but ultimately, it is up to each teacher to make the decision – just make sure you are making an informed decision! Effective uses of technology and media are active, hands-on, engaging, and empowering; give the child control; provide adaptive scaffolds to ease the accomplishment of tasks; and are used as one of many options to support children’s learning: I have kids who are faster, ‘smarter’ and more confident when they are allowed to type rather than write with a pencil. For them, technology is empowering and ‘levels the playing field’. Again, use your judgement with the interests of the child (not your own preference for a pencil and notebook over a laptop) dictating your decisions. Technology tools can help educators make and strengthen home–school connections: We have switched from cumbersome PDF weekly newsletters to an online blog to share class happenings with our parents – and they love it. I have had more than one parent who has subscribed to get email updates when new posts are up, comment that “Now I actually feel like I know what is happening and I rarely miss reading a post!”. It feels great to know I am connecting with the big people who have loaned me their little people for the year! Digital literacy is essential to guiding early childhood educators and parents in the selection, use, integration, and evaluation of technology and interactive media: Newsflash! 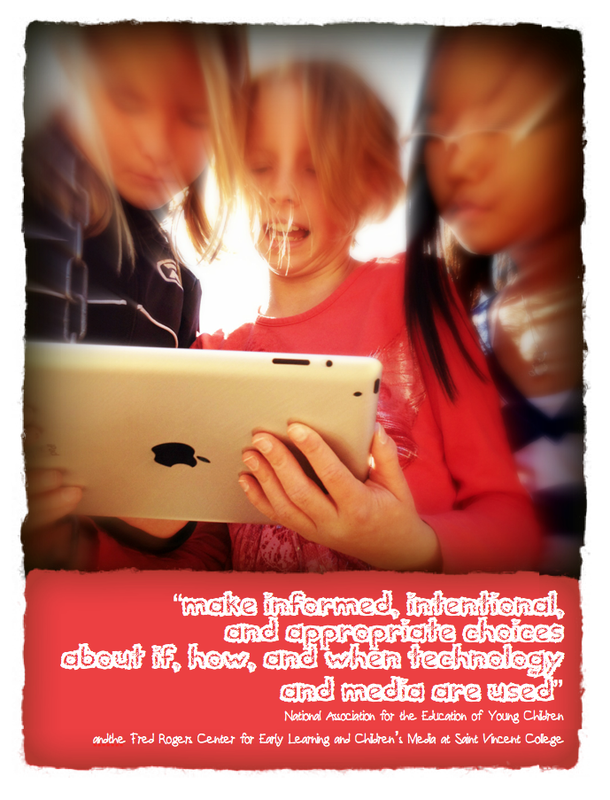 Digital Literacy is not just for our kids! We need to be just as literate! Is it harder for us, yes. Possibly. But that is no excuse! Remember, we can do hard things! Educators need training, professional development opportunities, and examples of successful practice to develop the technology and media knowledge, skills, and experience: This is a biggie! It is all well and good to buy the MacBooks and the iPads but unless you support teachers in their integration and scaffold their understandings or what and how and why we should use this technology, it won’t get off the ground at nearly the speed it needs to. Previous postThe Beauty of Vowels, Advice to Sink in Slowly, and the Birth of a Book.